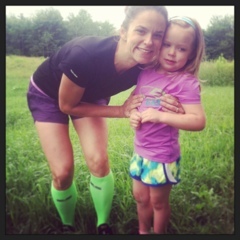 Last week Izzy and I set out for our first run together. We brought along the jogger - her words "just in case I need a rest". But honestly, she didn't really sit in it a whole lot. She told me that she wants to always go with me when I run. I love this girl! 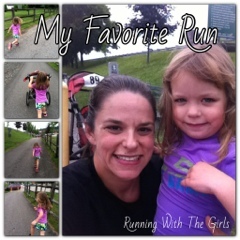 I am looking forward to many more of these runs with my favorite little girl! Just wait a few years and then sign her up to do a local 5K with you. 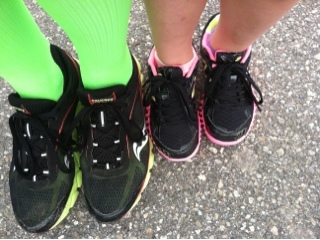 I look forward to running with my daughter more as she gets older (though I fear she is on the verge of outrunning me). Oh my gosh! All the cuteness! I love this - so sweet! How sweet! I can't wait until I can bring my girls along with me! I love how they ask me every morning if I ran! 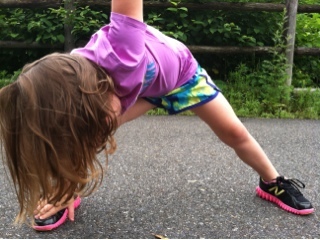 Love that, love when my daughter wants to run with me. She always talks about how when she is bigger we will do a marathon together. I love that! So very sweet. You are making wonderful memories! Aww so cute! I love that you went for a run together. My brother, my mom and I would go running together when we were on cross country. People said we looked like mom and baby ducks, ha! This is too much cuteness! Love her photo stretching! lol.